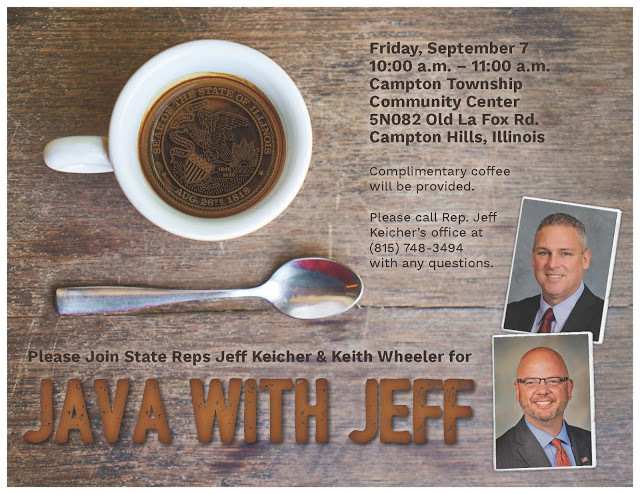 KANE COUNTY– Local residents with questions or concerns on issues impacting the State of Illinois are invited to attend an upcoming coffee hosted by State Representative Jeff Keicher, R-Sycamore, who announced his “Java with Jeff” Listening Tour of the 70th District will stop in Campton Hills on the morning of Friday, September 7. Complimentary coffee will be provided courtesy of Representative Keicher. Constituents who are unable to attend the “Java With Jeff” but still wish to provide feedback to Representative Keicher can do so online by visiting www.repkeicher.com and clicking “Contact” on the homepage menu, or by calling the District Office in Sycamore at (815) 748-3494.